I was resistant to going gluten-free for a long time. I had spent so long cultivating good sourdough recipes using spelt (which is glutenous 😦 )that I couldn’t bear the thought of having to learn something new All.Over.Again. As it turned out, my oldest daughter loves baking and so she scoured Pinterest for recipes and got busy in the kitchen. I hardly had to do a thing to find new favorites, but the thing we all really missed was a good biscuit! The sourdough fermentation makes them soft and easy on the digestion. The psyllium husk holds moisture, acts as a binder, and keeps the texture real, not gummy. They are soooo GOOD! THis has become a tried-and-true recipe at our house. Everyone gets excited when Mom makes biscuits! 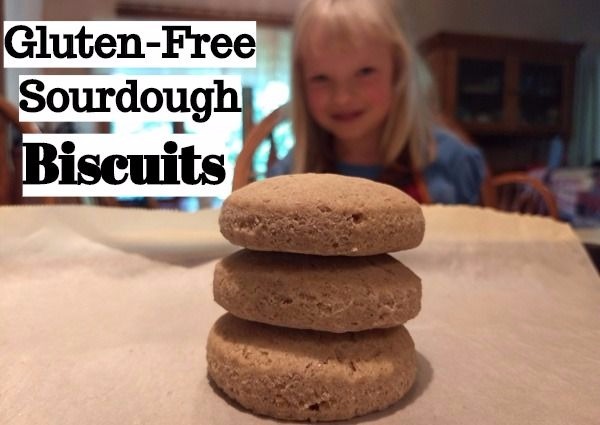 To print a PDF of the recipe, click:Gluten-Free Sourdough Biscuits. Use starter that has been fed in the past 12 hours. When well combined, cover and allow to ferment 7-12 hours. Sprinkle 1 teaspoon of baking soda and 1/2 tsp. salt over the dough and then mix thoroughly. It will take on an airy feeling as the baking soda reacts with the acidity, neutralizing the sour flavor and adding a small rise to the dough. Roll out to the thickness you desire. It will not noticeably rise in the oven, so decide now how thick you want them. I have not noticed it affecting the bake time. My kids like them about a half inch, smaller, so they can have “more” and feel like their servings are generous. I have also rolled them out to approximately 1 inch. I get between 8 and 12 biscuits depending on whether I make them smaller or taller. Use a spatula or other flat utensil to lift off up and place on a baking sheet. You can use parchment paper if you’d like, but it’s not necessary. Bake for 8-10 minutes on a traditional baking sheet or 10-12 minutes on a stone pan. Allow to rest for a few minutes and then slice, butter, and enjoy! Thank you! I’m gluten free out of necessity. Can’t wait to try this as I miss sour dough! I’m so glad that you can benefit from it, then! Have a blessed day!